Yeah, so here we are again. Time flew but it seemed like a long wait, anyway. Looked for grouse, and found some, in the second spot we tried. The first spot was too high and dry to hold the forest chickens, and – after a rough initial hike tripping up through some awful Medusa-head-covered mini-boulders, serenaded by mini-twirps ripping around on souped-up ATVs at a campsite below me – I remembered that the only time I’d seen grouse in this spot was in the winter. D’oh! Still, Angus found a covey of Hungarian partridge in the high grass on the ridge top, and Peat displayed what’s now become his trademark honoring of Angus – just a beautiful thing to behold, especially from such a live-wire of a dog. So we drove down the canyon to a creek I knew had water and, probably, grouse. Within 5 minutes the dogs busted an impressive flock of wild turkeys which must have boggled Peat’s tiny mind because their awkward aviating boggled my tiny mind, especially when they landed at the tops of spindly trees. 15 more minutes and I’d shot two ruffed grouse. Surely I could limit out in another half-hour. But two hours later it was still the deuce. Then a rock-solid point by Peat along the creek, backed nicely (and unusually) by Angus: I crept up and readied. Both dogs posed at the edge of a small cliff above the creek, and looked straight down at the water. 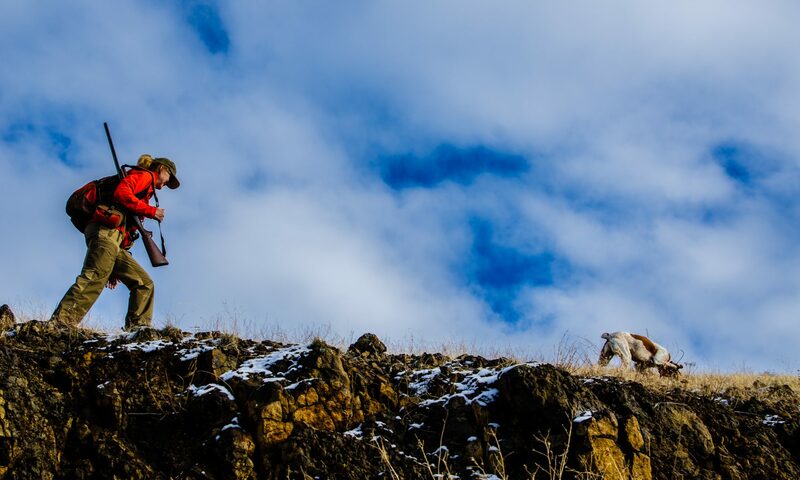 Losing patience but not wanting (thankfully) to jump, Angus found a way down to the water, triggering a spectacular burst of birds that initially appeared to be the biggest covey of grouse I’d ever witnessed but – when my tiny, slow brain caught up with the spectacle – registered as chukar. Numerous waves of chukar, whose mid-day thirst-slaking Angus interrupted, departed, numbering in the several-dozen. I’d hiked up this creek many times before, but had never seen these birds in the water. Predictions for a good chukar season appear accurate. A few minutes later, another sizeable covey flew past us higher up the hill. Then Angus busted a big ruffed grouse and I managed to drop it in the dense foliage along the creek. I wondered if either dog saw it fall. A few seconds later, Peat burst up onto the trail with the large bird and brought it right to me. Good dog, happy man. When I got back I was tired. I checked my GPS and found I’d hiked a mile more than my longest hunt last year. And for grouse. Don’t get me wrong: I’m very grateful for these delicious birds. But eagerness can lead to over-indulgence. All three of us are sore today. And I’m grateful to feel the slight remorse after a successful hunt, which I noticed was missing as I drove home yesterday. It made me slightly sad to think I’d become desensitized. If that does happen, I’ll have to think about putting away the gun. I hope not, at least for a while. After all, these dogs would never forgive me, and I’d miss that thing you only get when hunting. Bob- As always, enjoyed your shared experience. Understand completely regarding the precarious balance between the remorse and joy of hunting. Have a nice fall. Thanks, Bruce. Enjoy your days out this fall, too! Thanks, Ron. I should try the bag idea. My knees would likely thank me. Couldn’t agree more Ron ,been using zip lock bag too ,otherwise 1/4 or more of the water you pack ends up on the ground and not in your dog. Thanks for sharing Bob. I got out for the opener for grouse. Way over did my ability and payed for it the next couple days. Managed a couple ruffs but no blues. My pointer did find a few blues but didn’t hold in the thick cover and didn’t present a shot. I’m so excited for the upcoming chukar season. Really enjoy your articles and insight. Looking forward to new stories this year. Thanks, Dennis. Sounds like we had a similar first outing, although we didn’t see any big grouse. More birds than I’ve seen in a long while in these parts! Bob , I have had issues with my feet while I hunt on longer hikes. Mainly my big toes. I had a pair of aslo all leather. The brutalized my feet. Tried a different model of aslo’s and we’re not as bad and wore them out in one season. Now I have a pair of Lowa’s having better results or my feet are lasting longer into the hunt. I’ve tried about everything I’ve found to try to keep the pain and soreness away. Friction on my toes is my issue. I think socks are the best prevention after boots. Do you have favorite type of sock or have found a better sock? Have you addressed this before? Thank you. Dennis, sorry to hear about your foot problems. There’s nothing worse for a chukar hunter. I’ve always thought the Lowa boots looked good; glad to hear they’re working out better than the Asolos for you. Everyone’s feet are different. I use the thickest hiking socks I can find, which are Smartwool’s heavy-duty hiking socks, which combine Merino wool with some synthetic fibers (not cheap). But they last a long time, give me a little extra cushioning, and seem to keep moisture from staying on my skin so I never really have blister problems. Obviously, your boot needs to match the shape of your foot closely enough so that your toes don’t get cramped up, especially since going up and down and doing lots of side-hilling will put your feet through every imaginable kind of flexing they can take. I think I just totally lucked into the perfect boot for my foot. The sad thing is that Asolo doesn’t sell the boot I have (now in its 6th season) in the U.S.; they only sell it in Eastern Europe. The Vibram soles are almost worn completely down, and I’m skeptical I’ll be able to find anything close to what that boot offers me… If anyone’s headed to Croatia, let me know! I might have a boot request for you! Thanks bob, I will try the socks. I’ve thought thicker meant hotter but I need the cushioning so I’ll try that out. I looking at the bean upland pant you use. Not crazy about the look but look functional. I bought a pair of orvis Missouri break pant for a buddy as a gift. He hunted last weekend with me. They are the same money as the Beans. They almost look to sharp for the field but nice. He loves them. Think they will be an allseason pant too. To early to tell. Wish I’d of bought them for myself. Lol. I’ll keep procrastinating till everyone’s sold out. Ps think it’s pretty cool your wife goes on your hunting trips and records it to share with all of us bird hunters. Give her a big thank you for me. That would make my hunting life complete to have my wife go experience what I get to experience. Words and photos I take just don’t convey the actual being there. Hey Dennis, I’m keen on my wife being able to go with me, and realize I’m lucky that way. As far as pants, I only use those Beans (should get my second pair next week), regardless of temperature, and never need long-Johns. On the socks, I also only wear wool socks no matter the temp; they actually wick moisture better than any other fabric, so even when it’s hot my feet are cool with those thick socks. I look forward to hearing your foot stories this season. Best of luck! A thin cotton or synthetic sock liner under a medium weight wool sock will do wonders too, I learned that in my wildland fire fire days wearing logging boots. Chukar hunting I wear a thick wool sock with cotton crew sock, and it works wonders with leather mountaineering boots. Great as always Bob. Can’t wait till next week. Thanks, David. Neither can I! Glad to hear Peat is progressing nicely. Thanks, Jim. I hope it is progress. Time will tell, right? You’re gonna have a great time. Woodhead’s a great park, and the areas you’ll get to with those keys are very good. I’ll keep an eye out for you (not sure what our plans are then). Cheers!